Against the background of the beer market pickup in the first half of 2018, Carlsberg Group decreased their share while Efes and Heineken on the contrary performed well. However, the riot growth of cheapened economy brands by Carlsberg Group can change the situation by the end of the year. 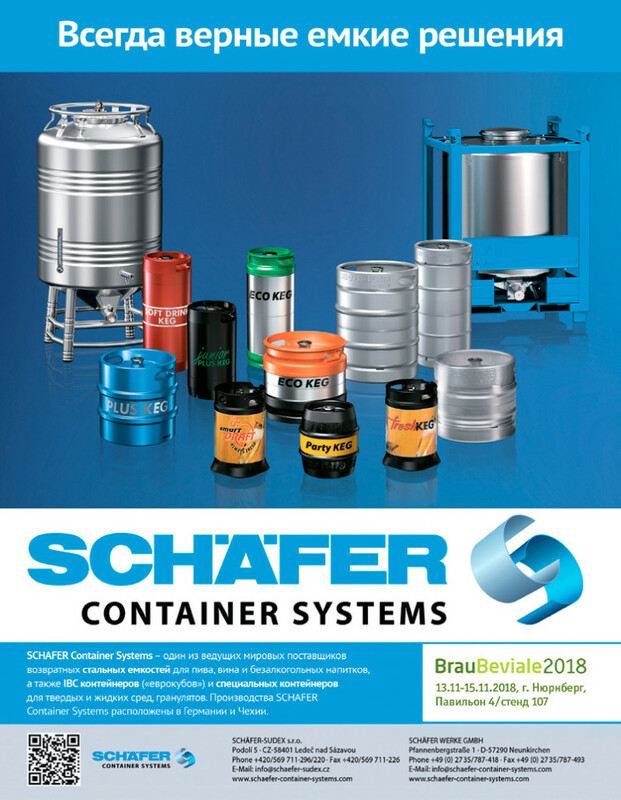 Besides, the share of private brands and German 5.0 Original, that is distributed by aggressively growing retailer Krasnoe&Beloe has increased considerably. The affordability of product in each price segments has become the key factor of competition in the modern trade. The enduring popularity of Zhigulevskoe and Draft in Off-Trade as well as the dales decline of youth brands are associated to the consumption shift towards older age groups. For the first time in ten years, spring-summer season of beer production and sales showed a clearly positive dynamics. Beer consumption was encouraged by warm weather, better consumer sentiment and world championship of football that lasted from 14 June till 15 July. Though the year beginning did not encourage optimism, but starting from the second quarter, both new data from Rosstat and data from Nielsen audit that are referred to by brewers, allow forecasting a 2-3% beer production growth nearly to 820 mln dal by the end of 2018. The final figures will depend on consumer sentiment and weather in autumn but in any case, the growth rates will be affected by the high base effect 2017 year-end. Brewers’ revenues can increase by 15% to … bn RUB by the year end of 2018 due to sale prices growth. At the same time, because of ruble devaluation, brewers’ volumes will expands less by dollars, that is approximately by …% to $… bn. Owing to higher-than-market import growth, beer trade balance (that reflects the market dynamics) in 2018 will increase by 3-4% approximately to 830 mln dal. In the nearest future, the state regulation will not influence substantially as proposals and new rules are passing early stages of consideration or are not formalized yet. Beer excise in 2018 will remain at the level of 21RUB/l and in 2019 it is not supposed to change. Because of price competition, beer sale structure by price segments is becoming more and more blurred and speaking figuratively, it is “slipping down” to lower price levels. For instance, there is a rapid growth of import beer from far-away countries (…) but due to its low price, this results in increase of premium but not superpremium segment. License segment is relatively stable by the market share, but it is dominated by rather affordable brands costing 50-55 RUB for 0.5l that could have been placed in the upper mainstream (…,…). 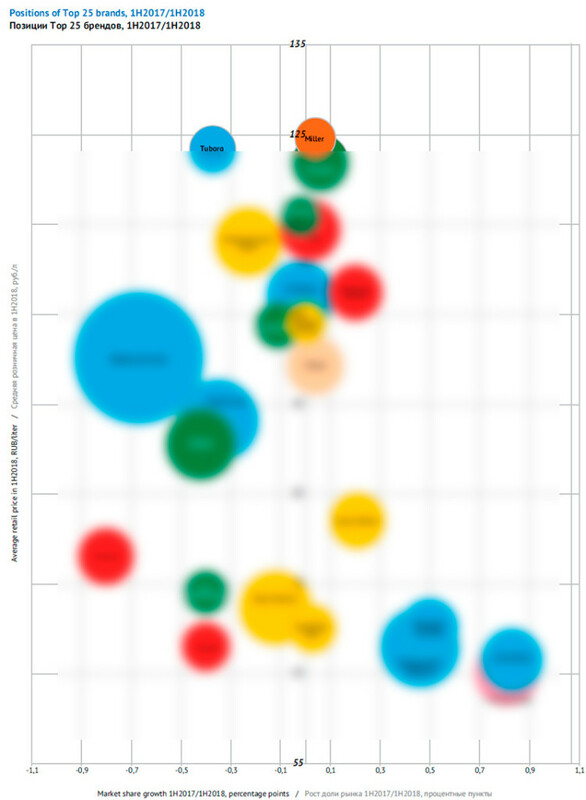 The retail price of certain sorts of famous mass brands (…, …, and …) more often corresponds not to mainstream but to economy segment. And even brands with low marginality are growing cheaper dramatically, gaining in weight at the same time (several sorts by …, …) along with private labels of modern trade. Fiercer competition in the economy market segment, as well as the race for sales volumes resulted in uneven dynamics of average sale prices and market prices for beer. According to Rosstat data average sale prices for beer made in Russia were growing fast from September 2017 to February 2018. At the same time, there was an intensive growth of retail prices, according both to official and independent data. However, then sale prices started decreasing and stabilized by the sale season and the average retail prices fluctuated with a certain slant to decreasing. We will later talk about the market leaders’ aggressive price policy. Despite the spring decline of retail prices, they remained higher than last year, that is why the beer market by value will grow by nearly 5% to … bn RUB by the end of 2018. 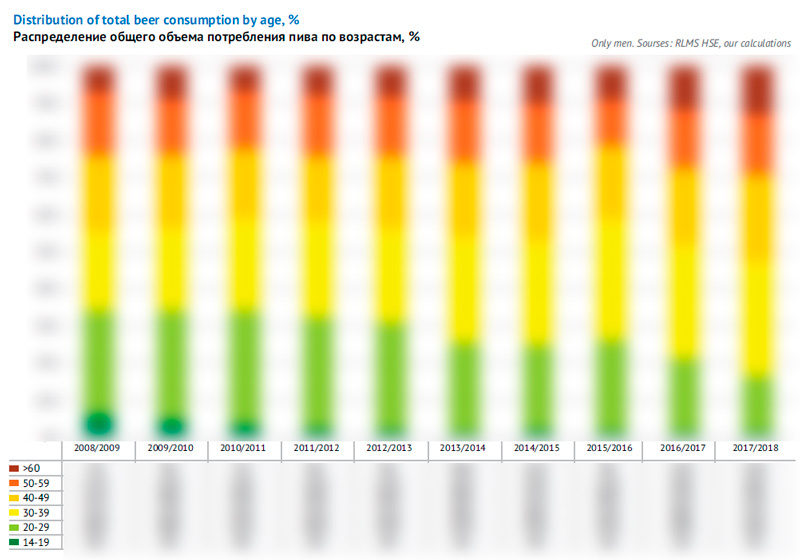 Because of the ruble devaluation, in dollars the beer market declined by 2 % to $… bn. The market is still ruled by the same trends if we look at the sales channels. According to brewers’ reports that refer to Nielsen data the sales in the modern trade channel continues growing while there is a sales decline in the traditional sales channel. … of beer is currently sold through super- and hypermarkets, though a mere decade ago the proportion was the opposite (in favor of common shops and channels of impulsive demand). Besides, according to market audit, within these two segments there is a growth of Draft in Off-Trade beer sales (we will speak about later). Unexpected trend of rapid recovery of import beer market share that emerged in 2017, went on in 2018. Thus, according to Federal Customs Service by the end of 2017, the import of alcoholic beer to Russia increased by 46% and reached 21 mln. Over January-July 2018 the import grew by next 63% and according to the current year results it will most probably hit the record, having amounted to nearly 37 mln dal. According to rather modest rates of the Russian beer market, such a rapid growth means that the import share in the trade balance by beer (taking into account production and export) will expand from 2.8% in 2017 to nearly 4.7% in 2018. Retail sales of import beer are behind supplies, that is why one can expect a growth of import market share by nearly 3.7% in 2018. The main contribution into the import beer market growth was made by EU countries, and the major suppliers increased their volumes more than others. Over the review period of 2018, Germany has increased its beer supplies by more than twice, the Czech republic has had a growth of 81%, and other EU countries have also expanded their volumes. The import beer market growth was supported by improvement of purchasing power among consumers as well as high activity of importing trade companies. 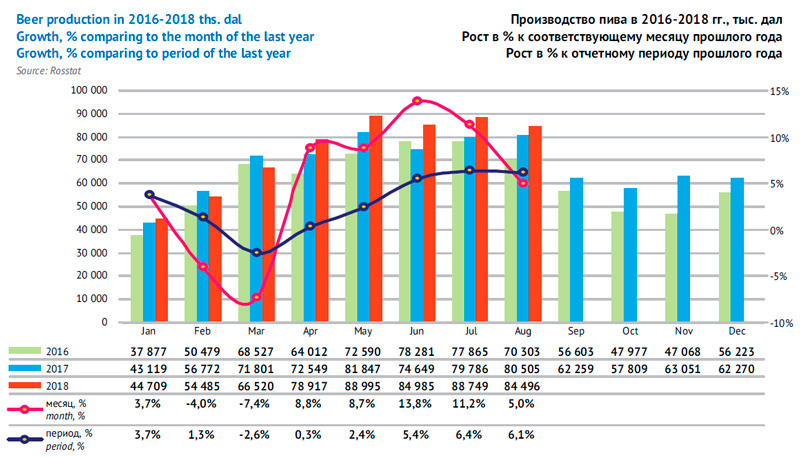 According to market players’ data, import beer positions have been mostly reinforced in Moscow, where in the first half of 2018, its share amounted to nearly …% (twice bigger than in the same period last year). Unlike Russia in general, Moscow population paid attention not only to cheap trademarks, but more often buying famous European brands that are much more expensive. 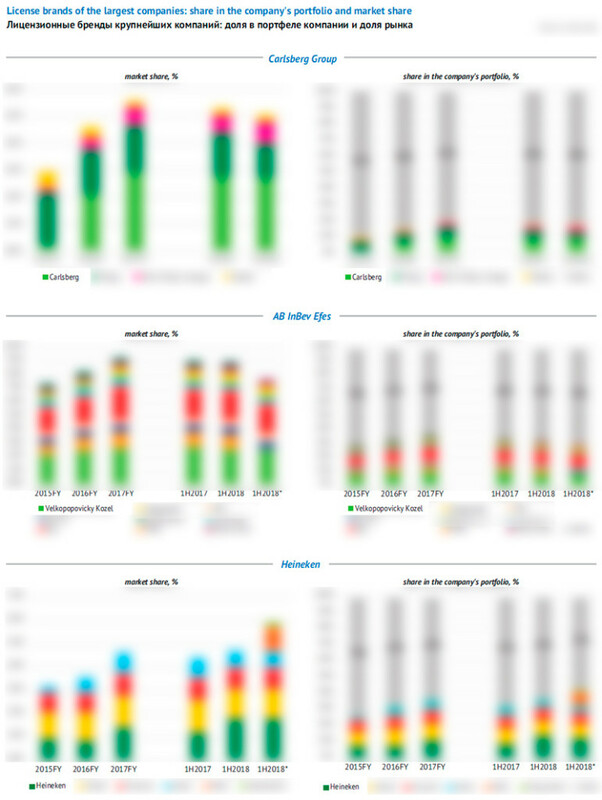 In the first half of 2018, the positions of … and … improved considerably. At the same time, decreased share of beer … that outstood with its wide distribution and rather democratic price. However, there is nothing surprising in this as … faced a mighty and affordable competitor, brand … we will speak in more details below. This year, there has also been a growth of export supplies of Russian beer. Starting from 2011, they were fluctuation but in general the trend was upward. In 2017, the export fall by 19% to 26 mln dal, while in 2018 one can expect a 25% growth to record setting 33 mln dal. 75% of Russian beer was sent to CIS countries, and this share has been almost unchanged since 2016. The key role is played by three countries, namely, Ukraine, Belarus, and Kazakhstan, all with nearly equal share of supply volumes. The supply increase was driven by many countries including Ukraine, Kazakhstan, Moldova and others. However, growth of beer export to China is the most intensive, which has contributed much into the general positive dynamics of 2018. Let us note, that when we speak of Ukraine we mean only Lugansk and Donetsk regions that are not under Kiev control and not accounted in customs statistics separately. And the key beer suppliers to Ukraine are not big transnational companies but independent producers with Russian capital (e.g. …). In the aggregate, they account for nearly …% of supplies, and the bulk of export is inexpensive beer in PET. 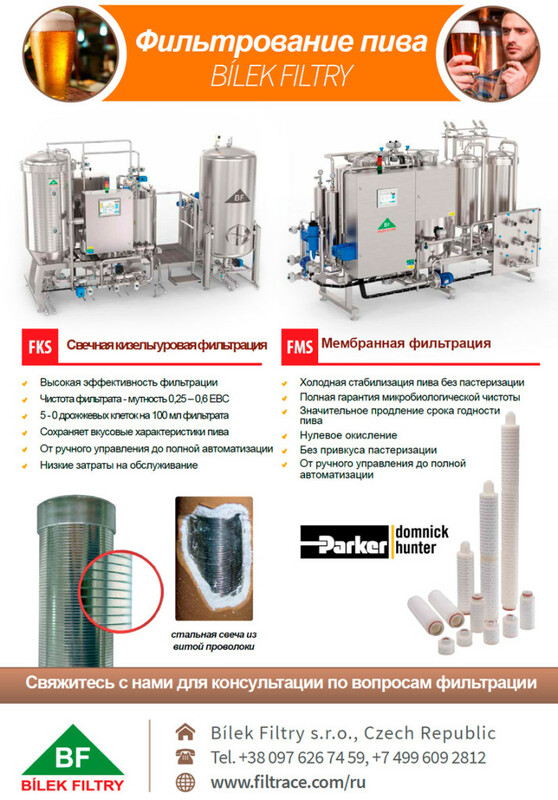 International brands from Russian territories are supplied by wholesalers, that are not affiliated with brewers directly. Export volumes depend on operation stability of breweries that are located on the territories of the breakaway regions. Consumer aging over the recent 10 years has already changed the market considerably and is still changing it currently. Long-term trend of beer consumption as well as changing in market share of categories and brands in 2018 can be fully attributed to demography. Older age of active beer consumers turns out to be a long term trend at the beer market. The previous definition of “core” consumers as males aged 20-39 is becoming outdated. Blurring of the age borders can be observed during 2011-2018 though the conditions for it were formed before. Correlation age-consumption has become considerably weaker, yet just ten years ago the peak of beer consumption was strongly-pronounced. 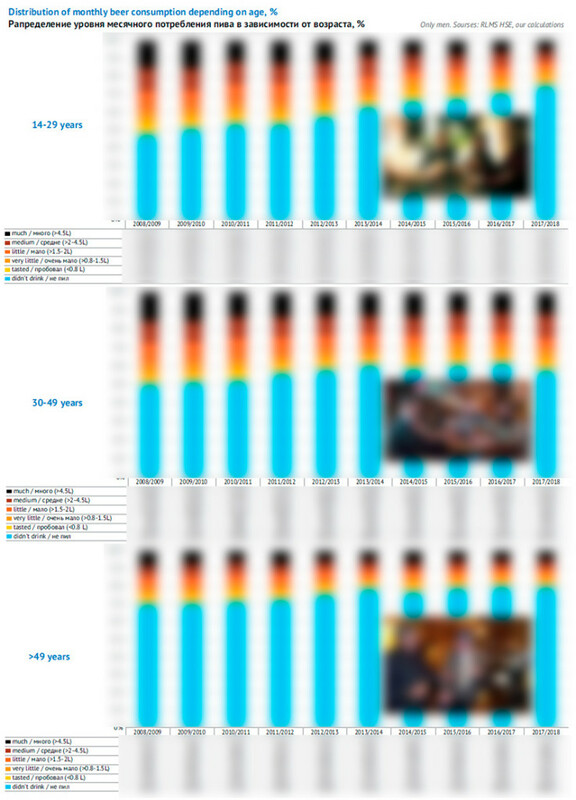 The key reason can be defined in a short way: new generation likes beer (and alcohol in general) less than the older one. At the same time, the aging audience remains loyal to beer and plays the key role for the market. Thus in September 2018, new data of national survey carried out in 2017/2018 concerning economic conditions and health among Russians RLMS-HSE was published. The latest survey confirmed the trend to smaller share of beer consumers in male groups aged 14-19 and 20-29. While as recently as 2008, the majority of consumers belonged to the age group 20-29, currently it occupies the third position after older groups 30-39 and 40-49. These days, teenagers drink many-fold less than ten years ago. Basing on long-term experience one could expect the generation on the 90-ies would develop love for beer as it grows older and tries alcohol. Yet many people rejected beer before having tasted it. There has been not so much alcohol rejecting among consumers who grow adult as ignoring of alcohol among new consumers entering young age group. Certainly, teenagers in Russia started drinking less beer due to stricter regulation of its consumption and sale, as the availability dropped dramatically. Yet, this trend was not local, but coincided with the world trend to frequency reducing of alcohol consumption by the youngest people, which originally emerged in 2006 (see global research “Health Behavior in School-Aged Children”). Currently, the process of beer consumption plays a considerably less important role in building personal connections and pastime of young people. The youth attitude to beer was influenced by the culture of healthy lifestyles and hipsters who form the consumption trends in the generation of the 90-ies. Now there should not be a lot of beer, but it must be a special sort. So, the popularity decline of youth mass brands results not only from demography. Yet, there is also good news for brewers. Over the recent years it has become obvious that the consumption core shifted from males aged 20-39 to group 30-49 years old. Besides, according to the poll 2017/2018, if we look at data in dynamics, shows that the beer consumption in groups under 30 is growing. This can be explained by the fact that this group is being enlarged by the beer loving generation. Besides, people born at the end of “developed socialism” have formed the most numerous generation that overflows the age pyramid. It is too early to tell whether this change is a temporary phenomenon. Yet, one must take notice that approximately till 2011/2012 there was active alcohol rejecting among males as they achieved middle age. Currently the alcohol rejection is smoothly shifting to older age. At the same time, beer lovers of preretirement or even retirement age started playing a considerable though not the key role at the beer market. Unexpectedly weakened influx of new beer consumers has considerably influenced the positions of certain brands. The consumption among young people was decreasing due to the share decline of beer lovers as well as frequency and volumes of beer drunk at one time. Naturally, well-known brands with youth positioning found themselves among outsiders as their audience was dramatically diminishing. Youth brands were also influenced by the general decline of beer popularity as social “communicator”. Such driver, which was obvious for older generations and is being actively employed by brand managers, does not have such importance for young people any more. Besides, beer as a drink has developed quite a conservative image. The introduction of restrictions on beer advertisement did not allow to effectively correct and actualize the image of youth brands. And the reduction of the advertising led to image inflation pressing down the low loyalty. During the recent years, only a considerable price decrease has been revived the sales of the youth brands (and vice verse). Among the survived youth brands on the market are Klinskoe, Tuborg, and Baltika Cooler. At the beginning of 2009, these brands belonged to TOP-5 beer brands, most often bought by young Russians along with the family Baltika of numbered sorts and Sibirskaya Korona (see poll of Profi Online Research). In particular, in 2008, the share of Klinskoe amounted to …% of the market. Just in 2015, despite the deteriorating of the brand positions it had remained not only a mass sort but a leader of the Russian market with a share of …% (if we consider the numbered sorts of Baltika as separate brands). But by the first half of 2018, the share of Klinskoe declined by about …% and brand has already moved to the tail of the first ten by the sales volume. Beer Baltika Cooler saw a slower position decline than its competitor. In 2006, the brand entered the Baltika family. 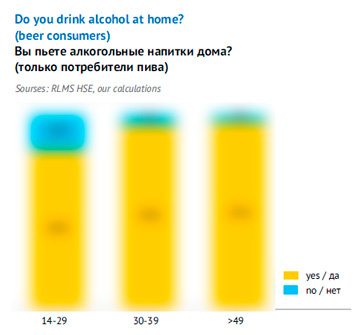 At that time, the target audience aged 18-24 was the most active consumer group as it accounted for 27% of beer drunk in Russia. Cooler was made affordable by price and distanced from the basic product line, having withdrawn from the conservative numbered sorts. Such strategy used to be very successful – the subbrand developed popularity very rapidly, by 2008 its share equaled about …%. Then its sales were supported by launching of original sorts and big package, but in several years there started a stage of lengthy decline which was also driven by pressure from license brands. In 2015 the share of Baltika Cooler reached about …% and in 2018 it has gone down to less than …%. License Tuborg has had a negative trend of the market share, yet, the dynamics has been uneven. Carlsberg Group has been striving to support the brand by restyling via youth events and new sort launches. Simultaneously, Tuborg has been growing more affordable which allowed to considerably slow down the negative dynamics. Despite the local growth in 2014 up to …% of the market, by the year-end the brand saw its share shrink and yielded its positions in the license segment to beer Velkopopovicky Kozel. Late in 2017, there was another stage of Tuborg positions deterioration. By the end of the first six months of 2018, amounted to …% having lost nearly … p.p. In 2009 the fast growth of Doctor Diesel hit a snag as its share reached …% of the market. 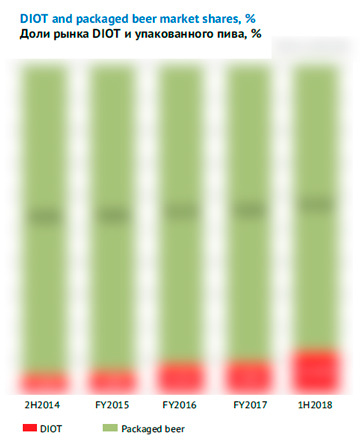 Gradual decline of the positions (to …%) went on till 2015, and then accelerated and currently the brand share equals …%. Some well-known youth brands disappeared from the market, despite their great popularity, obtained due to powerful advertising. 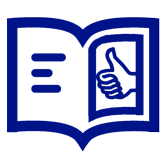 The most demonstrative examples are democratic brand Sokol by Efes or premium Brahma by AB InBev. Summarizing the above, one can state such figures. 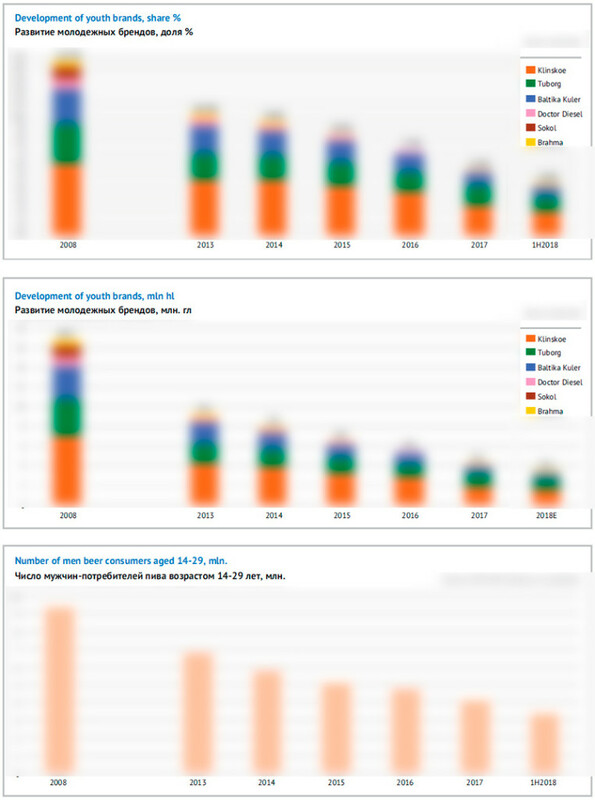 While in 2008, the net market share of the top three (Klinskoe, Baltika Cooler, and Tuborg) exceeded …%, currently, it is below …%. If all youth brands are taken into consideration, the situation will look even worse (as some of them have totally left the market) – the decline from …% in 2008, to nearly …% within the first half of 2018. As we know, over the recent 10 years the beer consumption has shifted to older age groups as there was none to replace them. The same people who in the past promoted a riot growth of the beer market are still consuming it by considerable volumes on having growing old. So, today the trends on the beer market are determined by mature consumer that was born even before 1980. One of the outstanding trends is the market share growth of nostalgic brands as well as those targeted at the mature audience. In the first place we certainly mean brand Zhigulevskoe, which does not belong to anyone, yet it has been ousting well-known brewing brands from the market. In 2018 Zhigulevskoe by many Russian producers has become the major Russian brand with a …% of share in retail, having exceeded the Baltika brand family. If we take into consideration brands similar to Zhigulevskoe and its derivatives (for instance Zhiguli Barnoe), we will have to say that the people’s brand has become a leader with …% as far back as in 2016. Then it continued gaining market weight and currently the family of Zhigulevskoe exceeds …%. 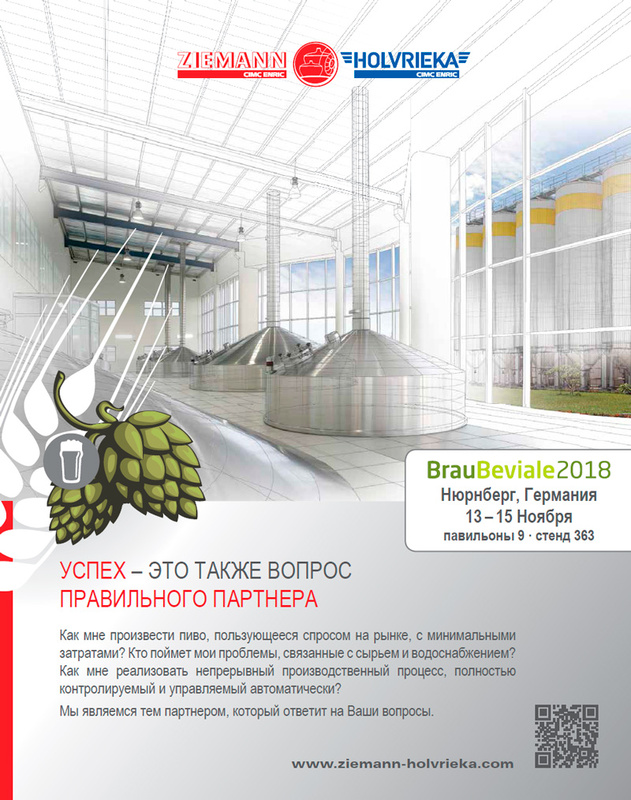 As a response to the retro-trend about 160 of Russian brewers of different scale (including 50 major regional breweries) included Zhigulevskoe into their portfolio. Yet Zhigulevskoe can not guarantee stability of sales, they easily “flow” from one producer to another. For example, draft beer shops with limited set of sorts want only one Zhigulevskoe supplier. And on the retail shelves, the choice of Zhigulevskoe is determined by the price. Among Russian producers of Zhigulevskoe Carlsberg Group has obviously taken the lead. In 2018 the company has massively increased their share at the cheap beer market through considerable cut in prices for Zhigulevskoe and another brand for mature consumers, that is Arsenalnoe. Long-term consumption trend is sales flowing into the segment of Draft in Off-Trade (DIOT). Against the general increase of beer consumption, in the first year half of 2018, the share of DIOT went 2.4 p.p. up compared to the same period last year and amounted to 12.5% of the total beer market according to Nielsen* data in Carlsberg Group’s report. The DIOT beer share has grown twice since 2015, gaining 2p.p. each year. Historically DIOT growth was taking place along with consumer core sliding towards older age groups. Among people who are over 35 now, there are many lovers of draft beer with special taste that are much different from the mass brands. The fresh beer taste and the process of beer dispensing are associated to bright and positive emotions by mature people. Besides the DIOT share also got a mightily impulse for development due to bans that were introduced during the last decade. Beer bought off-trade at a shop, is drunk at home or at some other private place. The government has done much to strengthen such style of home consumption. Bans on beer consumption outdoors or on beer sales at the channels of impulsive demand (kiosks in simple terms). Nowadays beer is more often bought beforehand and in large volumes. After the ban on selling packed beer in large PET, it is convenient to buy big volumes of beer only at specialized retail. Besides, in regions draft beer by medium-sized breweries is very often presented in the economy segment and competes by price with beer in PET on supermarket shelves. Earlier, packed beer cost much less if packed in big bottle, but now it is impossible to make an attractive offer. However, there are exclusively psychological reasons for home consumption and loyalty growth to draft that are probably not connected to state regulation directly. Romir research, carried out among men aged 18-55 in Russia showed interesting differences in taste assessing and appreciating depending on the place of consumption. Control groups were drinking the same beer (Baltika#7) at a warehouse, bar, and home environment. It turned out that the highest scores by all criteria were given during taste-off in simulated home environment, as home environment on the one hand allowed to better perceive the beer taste, and on the other hand it made subjective taste sensations much better. Thus against beer consumption at a bar, three time more men liked Baltika#7 at home very much. Besides, home environment strengthened loyalty to beer better than bar or warehouse (basing on the answers to a question on further choice of the given beer sort). Let us note that according to many surveys home consumption style is a social attribute of mature beer lovers. Basing on newest data by RLMS-HSE, we can say that comparing age groups 14-29 and 30-39, it was found that the share of respondents who drink beer at home was three times bigger in the older group. As we know, DIOT market is very fragmented and medium-sized regional breweries are prevalent there. In the first half of 2017, the leading six companies (with a share of more than 5% in the segment) was made up by Carlsberg Group (…%), Trekhsosenskiy pivzavod (…%), Bochkarevskiy pivzavod (…%), Borihinskiy pivzavod (…%), and Tomskoe pivo (…%). Let us note that Heineken and AB InBev also belonged to the first ten but their share amounted to nearly …%. Yet, over the recent years, not regional breweries fueled the growth of draft beer sales. The consolidation of DIOT market is obvious, but it is taking place in the hands of two market players, namely Carlsberg Group and Trekhsosenskiy pivzavod. Generally speaking, their active expansion to the draft beer market started in 2015, (at that time Carlsberg Group's share in the segment amounted to …%, and the share of Trekhsosenskiy pivzavod was …%). But after 2016, Trekhsosenskiy pivzavod was rather maintain the positions, while Carlsberg Group went on developing very rapidly. Two years ago, Trekhsosenskiy pivzavod overgrew the regional scale and became a federal player, both in retail and DIOT. 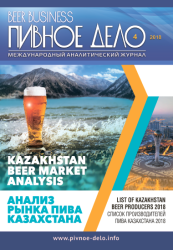 Due to their active regional expansion and aggressive price policy in 2017, Trekhsosenskiy pivzavod left Ochakovo behind, and today, its share on the beer market amounts to …%, and nearly …% in the DIOT segment. According to Carlsberg Group publication, by the first half of 2018, the company leads the DIOT segment with a share of 22.5%. Although five years ago Carlsberg Group was skeptical about DIOT but the prospects of PET-package prohibition made the management reconsider the significance of this non-traditional sales channel. It was clear to the company, what kind of product a substantial consumer group would switch to, so it invested a large amount in DIOT. • Quite affordable prices in each DIOT subsegment. For example, in order to strengthen the positions in the draft segment, the company dropped their prices for keg Zhigulevskoe at the end of 2016 dramatically. Resultantly, they have become more competitive and attracted the most rational and economizing consumers. • Launching of new draft beer sorts especially for DIOT segment, constant experiments and taste upgrading. For example, sorts Czech Kabanchik and Medovoe, as well as using several variants of regional names (beer Peterhof for a striking example). • In order for the producers’ signature on the label better fit to the regional image, even breweries have been renamed. For example, Baltika branch in Rostov was altered to Yuzhnaya Zarya 1974 and the brewery in Yaroslavl is again called Yarpivo. • Installing trade equipment in modern retail. Supermarkets along with DIOT are a channel of beer sales that is constantly increasing in weight. Carlsberg Group even opened their own branded departments of draft beer at supermarkets. 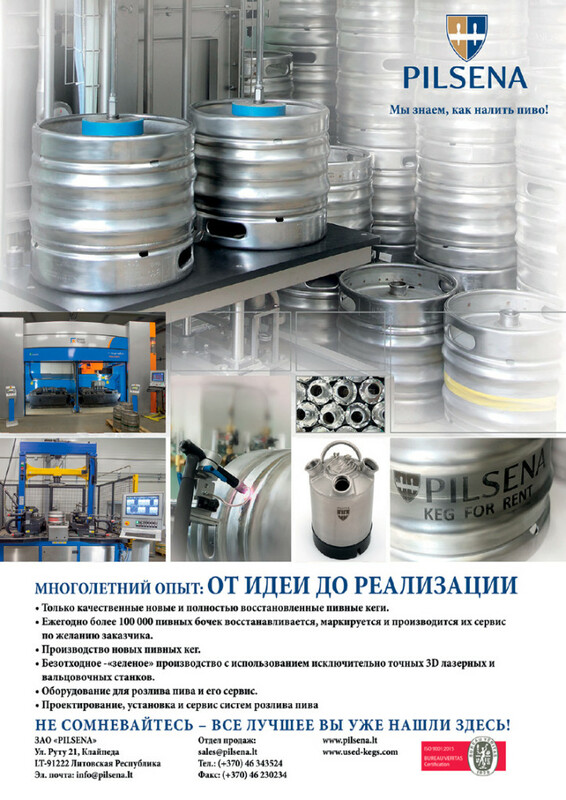 • Launching of new beer filling lines in PET-kegs that are gaining traction in draft segment. Carlsberg Group according to the report was represented in more than 29 000 draft beer outlets last year. And for the company the DIOT channel share during the first half of 2017, amounted to 10% of the total sales volume. Basing on the existing dynamics, during the first half of 2018, the channel share probably exceeds 12%. Let us note that the fast growth of the market share of Carlsberg Group and Trekhsosenskiy pivzavod in DIOT segment is much connected to the fact that the both companies are key partners to Krasnoe&Beloe alcomarket chain we will speak about below. Thus, Arsenalnoe and Zhigulevskoe by Carlsberg Group that showed the best market share growth in the first half of 2018, are the most affordable brands of draft beer at the assortment of biggest Russian alcodiscounter. The assortment also includes varieties with special positioning, for example, “Nevskoye. The classic recipe”. Trekhsosenskiy pivzavod is represented by its major brands Dub and Obruch as well as brands Barkhatnoe, Venskoe and Pshenichnoe. A mature consumer is normally not ready to believe advertising images and interested in the actual origin of a product. Otherwise regional brewers would have not won the market of transnational companies and import beer would not have become able to compete with license world brands. For consumers over 35 import products have been and still are closely associated to high standard of living, a status product. The fact of beer production in Germany, Belgium by itself is an argument for this product choosing. The import beer market is limited only by its high price compared to premium Russian brands as well as by low level of distribution. These factors changing gives a multiplicative effect. Thus, a riot growth of German beer sales starting from 2017, is in the first place connected to launching of 5.0 Original the price for which (55 RUB for a can) corresponds not to superpremium but rather to upper mainstream of the market. In Russia the brand is represented by three sorts. Nearly …% of sales accrues to wheat sort Weiss, one … accrues to Craft sort, and roughly one … is accounted for by Lager sort. The design of 5.0 Original is rather laconic, but eye-catching which makes it well noticeable on the shelf. Beer for the Russian market is poured at Monchengladbach Brewery. This business belongs to Oettinger group that is known for their international activity. Successful launching of 5.0 Original on the Russian market was secured by price affordability and wide distribution which was provided by the trade partner - Krasnoe&Beloe. These alcomarkets famous for their developed network of 6669 outlets (at the moment of the article preparation), as well as for mighty regional expansion and aggressive price policy. Company Krasnoe&Beloe was founded in 2006 by Sergey Studennikov, a businessman from Chelyabinsk. Today, it operates in more than 50 Russian regions and yields only to two federal general food retailers by the number of outlets. Small scale of the shops allows picking up vacant outlets that do not correspond other businesses’ demands by territory, format or class. According to Infoline prognosis, Krasnoe&Beloe can annually open 1.5-2 thousands of new shops. The chain will expand to Moscow region and Saint Petersburg where its shops have not been well represented yet. Thus, within this time, Krasnoe&Beloe will increase the number of their shops to 13 thousand. Krasnoe&Beloe at the beer market acts as a discounter with an aggressive pricing policy that strives to give a retail price lower than the average in a region. Besides, competitors have not once accused the company of damping when some beer brands were sold at loss in order to attract consumers in case of opening new outlets or selling accompanying product categories. Generally in Russia the share of 5.0 Original equaled …% in the first half of 2018, which is very much for a previously unknown brand from far abroad. Besides 5.0 Original has become a leader at a heavily fragmented import beer market. The brand’s share in the import segment amounted to …% in the first half of the year and will probably exceed …% by the end of 2018. Uneven distribution of outlets means that the market share of 5.0 Original also differs much depending on the geography. As the development of Krasnoe&Beloe chain started from the Ural, there is an apparent “slant” by the number of trade outlets in favor of eastern regions of Russia. For example, currently there is approximately equal number of shops in Moscow and Chelyabinsk, though the difference in the market volumes is great, and the expansion to Saint Petersburg has only started. 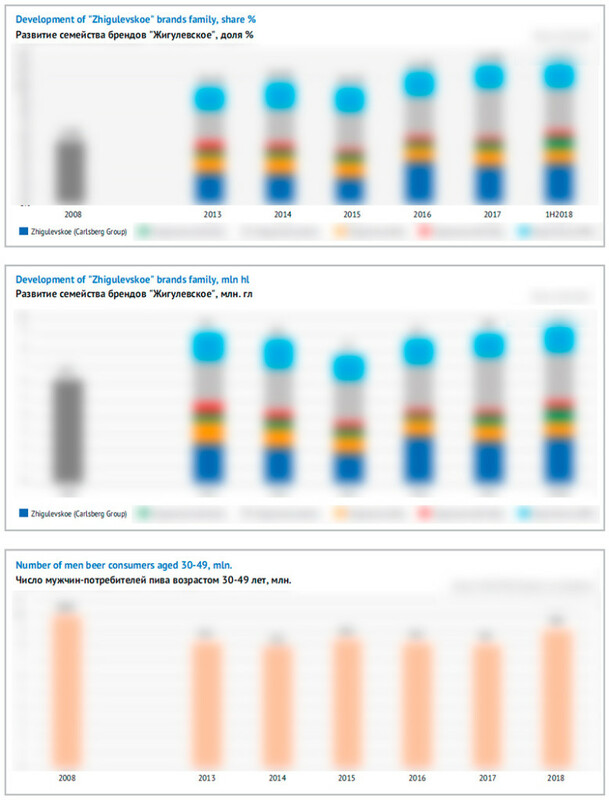 Correspondently the market share of 5.0 Original is much higher in the Ural region (nearly …% of the beer market), quite high in Moscow (about …%) but the brand is not so popular in the Siberia and very little known in the south of the country and Saint Petersburg. Beer output growth means that market players in order to increase (or at least keep) their market share have to expand their sale volumes. Efes and Heineken have shown excellent performance in 2018, as their growth rates are two digit and their share has increased substantially. Yet, neutral dynamics has led to share decrease of Carlsberg Group, AB InBev, and many medium-sized regional producers (if we look at their volumes in general). Merging of Russian assets of AB InBev and Efes against the background of improvement in positions of the joined company makes the leadership of Carlsberg Group not so absolute. However AB InBev Efes has lost two license brands and the growth of the company was attributed to price competition and football championship, so it is too early to say whether it is stable. According to Carlsberg Group message, over the first half of 2018 the sale volumes of Baltika in Russia increased by 1% (and by 10% over the second quarter). Regional statistics reflects approximately the same dynamics. The general beer production in the regions where Carlsberg Group is situated, increased by 2.6%. Dynamics that are close to neutral against the background of the Russian market revival meant that the share of Carlsberg Group went on falling. Under our assessment, in the first half of 2018, it decreased by … p.p. to …%. The market share first started declining in the third quarter of 2017, and stabilized at rather low level before the sales season of 2018. That is why, though Carlsberg Group have considerably yielded their positions to big competitors, in case of good performance during the season, the year result can be much improved (at the time of the article preparation, the results of 3Q2018 are still not known). When developing a market strategy, Carlsberg Group declares principle of “golden triangle” or the balance of three components, namely, volumes, operating profit and gross profit margin. However, due to volume loss, resulting from price cutting in PET segment by competitors, the balance has been broken and the company had to change prices for their own products. The market share started recovering, yet speaking to investors CEO of the company told about “flat” price mix effect in the 1H2018 owing to “successful promotional activities in economy PET segment”. In this case, Russia has become an exception, as the price mix in other markets of Eastern Europe (Ukraine, Belarus, Kazakhstan, and Azerbaijan) worked well for the performance. The market share fluctuations of the company can be considered an aftershock of ban for beer in PET of big volume and subsequent sharp intensification of competition in the segment 1-1.45l. Price attack (mainly from Efes company) made Carlsberg Group drop retail prices for Zhigulevskoe and Arsenalnoe to unprecedented level. The price for these brands in PET fell in the modern trade, while the price for draft beer went down mainly due to expansion of supplies to chain of alcodiscounters Krasnoe&Beloe. By our assessment, over the recent years the company has been pursuing the strategy of replacing a lot of their own regional sorts in PET with Zhigulevskoe because of pressure from independent regional businesses. From 2015, when the prospect of ban on big-volume PET still had no influence on the market to early 2018, when the ban was fully introduced, beer Don share declined …, Yarpivo and Samara …, DV and Uralskiy master dropped …, Chelyabinskoe fell … times, Sibirskiy Bochonok fell … times, and rather big Ural brand Legend virtually disappeared from the shelves. As the next step, Arsenalnoe brand was moved from the economy to discount segment, where it competes with private labels and once again, Zhigulevskoe. However, the positioning of Arsenalnoe as “beer for real men” allowed distancing from their own discount brand. The brand market share which was falling as recently as in 2017, has roared ahead and can reach …% by the end of 2018. According to Carlsberg Group report, over the first half of 2018 the share of Arsenalnoe increased by 0.7 p.p. while Zhigulevskoe and Bolshaya Kruzhka enjoyed a growth of 1.6 and 0.5 p.p. respectively. Thus, Carlsberg Group has managed to partially compensate the volumes lost by their own regional brands, respond to the expansion by medium-sized independent breweries and hinder the market share decline by volume. At the same time there was a market share decline of … by regional producers and … brand by Heineken. By our estimate, during the first half of 2018, the structure of the brand portfolio returned to the balance of 2016 by the economy/mainstream/premium component. However, now there is a smaller market share and outlooks for growth of the economy segment of the portfolio. Volume growth of Zhigulevskoe and Arsenalnoe allowed for partial compensation of the decline faced by regional brands by Carlsberg Group and made it possible to improve the positions in the major economy segment of the market. At the same time, there was further reduction in the market share of major mainstream brands of the company. Despite relative stability of the sales volumes and prices, Baltika brand family and Zatecky Gus lost approximately …% of the market, while there was market growth. In 2017, the decline in their shares was generously compensated by brand Carlsberg that was moved to the mainstream segment. But the sales of Carlsberg beer have been recently growing approximately at the market rate, so the brand’s share came close to …% and stopped increasing. In the premium segment there was a further decline of Tuborg which can be to some extent explained by the pressure from rapidly growing Heineken. However long-standing reasons for the negative trend of Tuborg lie in the target audience reduction that we have discussed above. Continuing rapid growth in sales and market share of Seth & Riley`s Garage allowed the company to smooth the situation in premium (and wider license) segment. Thus, Carlsberg Group have taken effective measures to restore their market share that are likely to result by the year end, the sales structure of the company has considerably shifted to inexpensive beer. The performance of the joined group will look better and smoother than assessment of Efes and AB InBev separately. The shares of two members of the alliance are in phase opposition by many reasons. Weak start of the year at AB InBev is fully offset by Efes growth due to the company’s activity in the economy segment of the modern trade. And vice versa, the risks of Efes market share reduction in the third quarter and second half of the year can be evened by AB InBev activity during the football World Championship. Efes in the first half of 2018 showed the best results among big brewers. Basing on the reports by big companies and regional statistics data, the growth of production and sales during that period reached 15%. 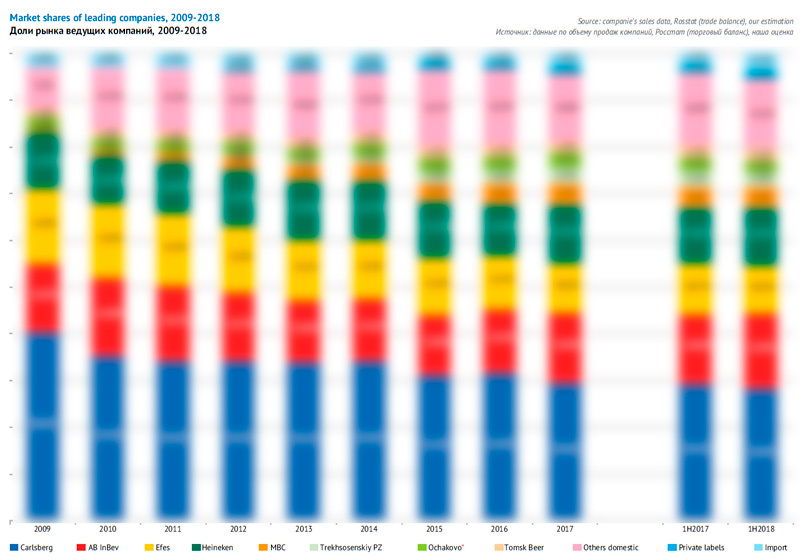 The company’s market share went up by … p.p. to …%. After a long ‘plato’ it sprang up early in 2018. Such performance is in our view associated to active price policy of Efes in modern trade. Over 2015-2017, the company’ s sales were driven by license brand Velkopopovicky Kozel that was getting ever cheaper, but in 2018, it stopped growing and the brand market share went a little down. Currently the focus has shifted to the lower price level, as the retail price decline for Stariy Melnik has made it one of the most attractive brands at the market of packed beer with an image corresponding to mainstream segment. A sharp price fall took place in the modern trade, where a bottle of Stariy Melnik cost a quarter cheaper in midsummer then in summer 2017 or …% cheaper then at the beginning of the year. The competitors certainly also took steps for price stimulation of their sales, yet they were not so massive and prolonged in time. In fact Stariy Melnik in modern trade has moved to the economy segment of the market. Possibly, it is a temporal measure or it is connected in some way to Efes and AB InBev joining, where Stariy Melnik is not supposed to compete with certain brands. Economy brands by Efes that are mostly represented in 1.4l PET bottles have also enjoyed sales growth. … sales have not grown much but enough to allow the brand keeping the market share. Instead, the market share of beer … has been growing. Despite some reduction in market share of … many other license brands have provided for the company’s positions improvement in the premium segment. Thus, the sales and market share of … that has been promoted in the recent years and in 2018 has become more affordable. Rather aggressive price policy of Efes allowed the company to increase sales volumes, but has already resulted in response from competitors (for instance Carlsberg Group’s activity in the economy segment). Besides, the period of prolonged slides of retail prices of Efes seems to have finished, which has had an immediate effect on the company sales. So in our view, Efes is not likely to keep the market share that was won by the end of 2018. In tune with long-run trend, in the first half of 2018, AB InBev market share went on decreasing. In our estimate, it has fallen by … p.p. to …% against the background of the growing market, the net outlet volumes of the regions where AB InBev’s breweries are located, have virtually remained the same. However, from the point of view of the regional positions, AB InBev faced the biggest failure in Moscow market, where the sales of the company’s … brands (excluding beer … and … brands) have fallen substantially. Certainly, now AB InBev should not be considered separately as it is a company joined with Efes. Yet in 2018, it was AB InBev that according to previously concluded agreement became the primary sponsor of football World Championship. That gave them the right for exclusive sales and beer advertisement at stadiums, fan festivals and within a 2-kilometer radius of stadiums (under the contract brands Bud, Bud Alcohol Free, Klinskoe were represented). Taking into account the market overregulation, AB InBev got a big advantage over other brewers. At the time of the article preparation, we did not know the results of the third quarter 2018, yet it was already obvious that by the high season and during the football World Championship, the sales and market share of AB InBev overcame the downward trend and started growing rapidly. Even if this growth was temporal, by the year end AB InBev market share may well increase by a couple of percent. Especially taking into account the low base of summer and autumn of 2017, when the company had a declining trend. 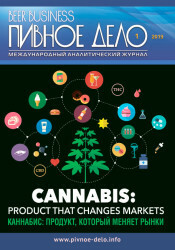 Active promotion of Bud brand along with rather affordable retail price, allowed the brand entering the three biggest license brands in Russia. It became the biggest brand in the company’s portfolio, accruing to nearly a fifth of sales. Yet, the key reason for the company’s positions deterioration in 2017 and at the beginning of 2018 was the market share decline of Klinskoe (from …% to …% over this period). To our opinion, the fall of the brand sales resulted from fiercer competition in the economy segment of packed beer, where mass sort Klinskoe Svetloe moved in 2015. Besides, one should notice rapid share reduction of license brand … in the spring 2018, though the brand had been growing at a good rate. In September 2018, Heineken and Molson Coors announced a long-term partner agreement, according to which Heineken in Russia got exclusive right for producing, distributing and selling of brands Miller Genuine Draft and Staropramen. According to the agreement, supplies to wholesalers will start on 15 December, 2018, and the modern trade channel will get the first shipments on 1 January 2019. Brand Miller appeared in the Russian portfolio of SABMiller in the 2000s, as license brands started to gain popularity rapidly. In 2015, after takeover of the company, its assets and license for Miller production were given to group Anadolu Efes. In return for them, 24% of Anadolu Efes capital went to AB InBev (which became a precondition for future alliance AB InBev Efes). However, one more participant of SABMiller take-over was group Molson Coors, that in 2016 acquired MillerCoors as well as rights for American brand Miller outside the USA as well as European brands Peroni, Grolsch, and Pilsner Urquell. Brand Staropramen used to belong to AB InBev, but in 2009 accumulating funds for take-over, the company sold it along with other assets in the Central Europe. In 2012, these assets including Staropramen were acquired by Molson Coors. The press service of AB InBev in Kommersant newspaper explained the cooperation suspending with Molson Coors concerning brands Staropramen and Miller Efes by “altered development strategies of the companies on the Russian market”. In Ukraine we continue cooperation with Molson Coors concerning the mentioned brands without changes”, - said a representative of AB InBev Efes. In our opinion, transfer of license to the Heienken’s for production of Miller Genuine and Staropramen was in the first place connected to AB InBev Efes alliance formation. After joining the portfolios of two companies, it contained nine known license brands. In decreasing order by weight they are: Velkopopovicky Kozel, Miller, Bavaria, Efes, Bud, Lowenbrau, Hoegaarden, Stella Artois, and Staropramen. Such a big number of brands would inevitably lead to cannibalism and certain SKU hollowing-out. Transfer of Miller brand will solve this problem on the one hand and on the other hand, it will influence positions of AB InBev Efes. Over the recent years, Miller market share was growing at rather high rates from nearly …% in 2014 to …% in the first half of 2018. At the same time, Miller has remained one of the most marginal brands in the premium segment, and its retail price exceeds most license brands by competitors. In order to support the brand image, Efes was quite actively promoting it on TV. Over the recent years, the number of GRP (advertising contact with audience) for Miller was comparable to brands Velkopopovicky Kozel and Stariy Melnik. Losing brand Staropramen will be much less painful for the new alliance as the brand’s market share under AB InBev control was slowly sliding down in long-run trend. 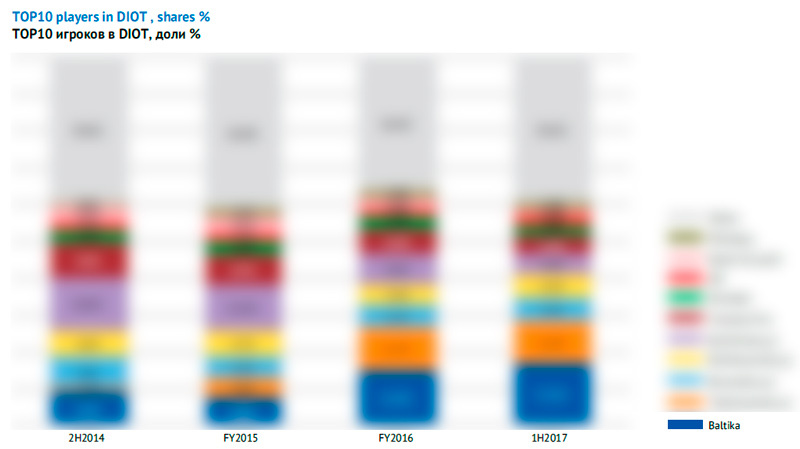 While in 2014 it amounted to nearly …% of the market, in the first half of 2018 to …%. Judging by reports AB InBev has long ago defined the first line brands (Bud, Stella Artois, and Corona) and the second line brands for local markets (Lowenbrau and Hoegaarden). Staropramen and Miller (outside the USA) found themselves pressed to outer circle of AB InBev interests. At the same time, accounting of Molson Coors for 2017 shows that Miller and Staropramen belong to four top-priority brands of the company at the European market. So it was logical for the company to overhaul partners and consider possibilities of increasing license charges. Transfer of license to Heineken is obviously connected to the company’s intention to constantly and effectively expand their presence in the marginal segments of the Russian market. In our opinion, a certain role was also played by the fact that Molson Coors does not compete much with Heineken at a global scale. 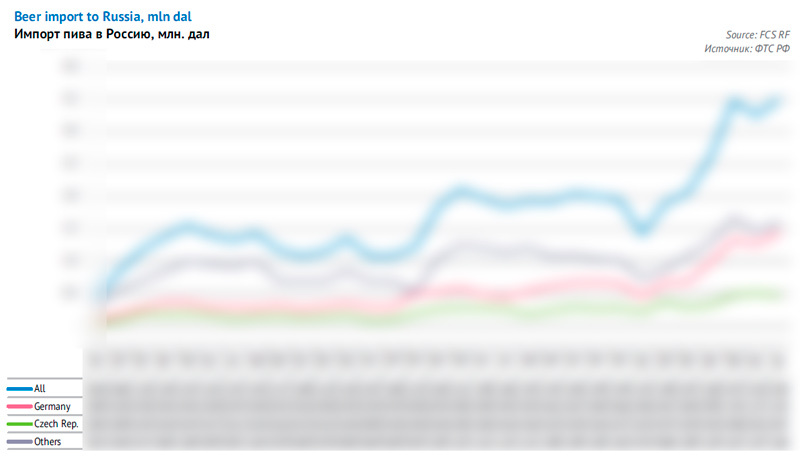 Data on Heineken’s market positions look contradictory to some extent. The reports of brewing companies cite assessments based on Nielsen market audit, according to which in the first half of 2018, Heineken’s market share declined by nearly … p.p. to …%. This means that against the growing market the company’s sales volumes are likely to have remained at approximately the same level. On the other hand, in the report of the parent company for the first half of 2018 it is said that “in Russia, beer volume increased double digit, benefiting from a strong performance of the economy brands and the continued growth in the premium market segment. Brands Heineken Lager as well as Heineken 0.0 continued to outperform”. By the way, the same growth drivers were mentioned when summing up the results of 2017. Quite possibly the difference in assessments can be explained by Heineken’s operation in the trade channels that are not covered by retail audit completely (HoReCa) or partially covered (specialized retail). This is completely correspondent to the fast sales growth of Heineken and economy brands. By the way, the sales growth by high rates is indirectly confirmed by the data of the official statistics by the regions where Heineken breweries dominated the net output volume. Aggregate beer production in these regions increased by …% by the end of the first half of 2018. 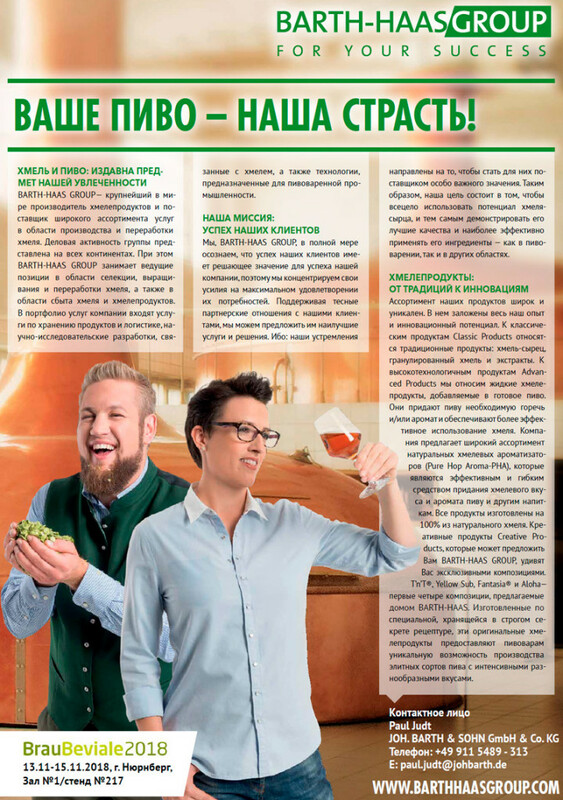 Heineken’ strategy on the Russian market lies in focusing on the premium market segments. At least the license brand share in retail sales of the company is growing much faster, then that of competitors. Since 2014, Krusovice is making a considerable impact to the company support at the market of license beer. Prior to that, a popular Czech brand was a leader among import brands from far abroad countries. Over four years, Krusovice has been gaining market weight and today its share on the Russian market amounts about …%. In 2015-2016 Gosser with lower price was driving sales, as it moved from premium to mainstream segment. Its share in retail has increased much, yet it soon stabilized at approximately …%. The present wave of rapid growth stared in 2017 when the share of Heineken brand expanded threefold. The brand became more affordable and received an unprecedented level of promotion (the number of advertising contacts exceeded that of Carlsberg and Bud twofold). The key role in advertising campaign and sales increase was played by global launch of Heineken 0.0 at the beginning of 2017. Emerging of non-alcoholic subbrand was followed by integrated campaign including TV commercials, social networks activity as well as promotion at trade channels. In Russia Heineken 0.0 responded to the growth trend of popularity of non-alcoholic beer and emergence of non-alcoholic versions of many major license competing brands. Launching of Miller Genuine Draft and Staropramen to retail at the end of 2018 will give a new impulse to the market share growth in the license segment. If Heineken manages to rapidly restore the distribution and not lose sales volumes, then the share of license brands in the company’s portfolio can exceed …% under our estimate. By the price mix the company will be considerably ahead of other market leaders. However shifting of sales structure to premium is associated to negative factor, that is, lingering market share reduction of brand …, which started losing retail volumes in spring 2018 under the competitors’ pressure. To get the full article "Leaders’ Plays and Regionals’ Shares" in pdf (33 pages, 26 diagrams) propose you to buy it ($40) or visit the subscription page. 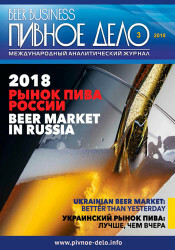 The article is prepared using the data by Rosstat, Federal Service of Alcohol Market Regulation, «Catalogue of Russian Beer Producers 2018», presentations and reports by brewing and research companies. 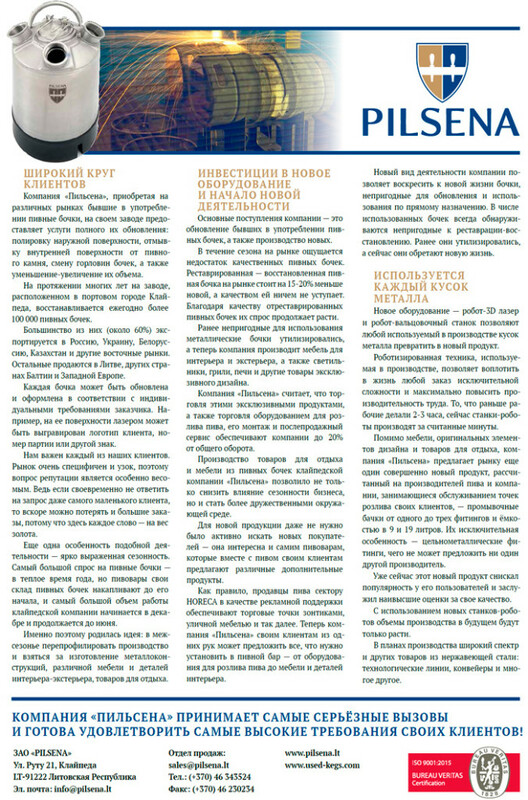 At the article preparation publications in editions Kommersant, Sostav.ru (OMD OM Group), and Vedomosti were used. Social surveys «Russian monitoring of economic welfare and health of population (RLMS-HSE)» is carried out by National research university — Higher School of Economics and CJSC «Demoskop» involving Population Center of North Caroline in Chapel Hill and Sociology Institute of Russian Academy of Sciences. (Sites of RLMS-HSE investigation are http://www.cpc.unc.edu/projects/RLMS-HSE and http://www.hse.ru/RLMS-HSE). All field reviews were carried out during "low" season of beer sales. The data on output volumes and their interpretation are our assessments based on the regional statistics and current trends in case the source has not been named. We do not claim the given information to be absolutely correct, though it is based on data obtained from reliable sources. The article content should not be fully relied on to the prejudice of your own analysis.